This great ebook contain detailed description about the Basic principles of Ayurvedic Nutrition, Ayurvedic qualities of various food substances in our daily use and over 100 delicious recopies! Concept of Prakruti (Constitution)	. Preparations of Beverages, Snacks, Soups, Rice , Khichari, Porridge etc. Effect on 'Dosha', of these recipes etc. 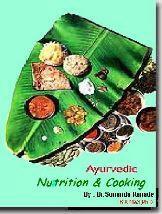 We are	offering 'Ayurvedic Nutrition and Cooking' in eBook form!